Debuting in 2012, Celebrity Reflection is the fifth addition to the popular Solstice Class of Celebrity ships. With her much-loved lawn area of real grass surrounded by hammocks and cabanas on her top deck, you’re sure to make the most of your time in the great outdoors while onboard Celebrity Reflection. 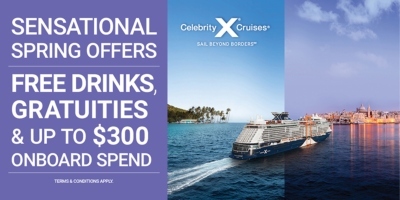 With staff to guest ratio of almost two to one, you’re sure to receive only the best in celebrity cruises premium class of cruising. Whether you’re looking to order room service, make the most of the poolside butlers or need help with a reservation, Reflection’s staff and crews are attentive to every detail and need. As well as the main dining room and buffet there are excellent options when it comes to drinking and dining on Celebrity Reflection. Qsine is the newest bar added after its popular debut on Celebrity Solstice. In Qsine, you order by iPad to be brought fantastic seafood dishes that truly make food into theatre. Meanwhile, Tuscan Grille provides classic Italian-inspired cuisine and Murano a twist of France. If you want to enjoy a meal outside, it is possible to have a picnic on the lawn or be seated at the Lawn Club grill where guests van even try their hand at Barbequing their own table’s meat and fish. For guests staying in AquaClass there is also the added benefit on Celebrity Reflection of guaranteeing you a seat in the intimate Blu restaurant. Only able to serve 32 guests, Blu serves up clean-eating, healthy, cuisine as delicious as it is nourishing. In the Spa, AquaClass guests can also grab a quick yet healthy snack or smoothie in the AquaSpa café- all while in your swimming gear! Celebrity pride themselves on being a cruise line catering to wide range of interests, with many specialist sailings taking place throughout their cruise calendar. On Celebrity Reflection guests can peruse a multimillion dollar art collection, attend a wine tasting or language class, cultural talk in the theatre or participate in yoga and fitness sessions. This is often in collaboration with celebrity experts and brands like Rosetta Stone while the art gallery has a guided tour via iPad. There is even an iStore onboard as well as other tax-free boutique shops. For those looking to enjoy the great outdoors while at sea, Celebrity Reflection is a perfect cruising option, whether you’re in the sunny Mediterranean or Caribbean, or taking in the awe-inspiring views of Alaska or New Zealand, the lawn club truly comes into its own. Uniquely to Celebrity Solstice class cruise ships you can play lawn games or relax in a hammock while taking in the sun and the views for which the class were named. There are also two outdoor pools with four hot tubs as well as a covered solarium for adults. In the evening there are of course the Broadway shows in the main theatre as well as a casino and a range of bars. In particular, Celebrity pride themselves on their beverages with a new cocktail menu recently introduced. You can take advantage of this, as well as over 500 varieties of wines, with a Celebrity drinks package. This is particularly special with celebrity, each venue having its own expert to help you select a wine for that meal or occasion. The Molecular bar is popular for some cocktail mixology while lounges are spread around with various musical performances. There’s also a vibrant nightclub for those wanting to dance the night away. In addition to the well-kitted-out fitness centre, like all other main ships in the Celebrity fleet, Reflection has fantastic spa and relaxation facilities in cooperation with Canyon Ranch Spa Club. At this famous American spa onboard, guests can book beauty and rejuvenation treatments while taking a dip in the plunge pool and relaxing on the heated loungers with a fantastic view of the destination beyond. For those wanting to truly unwind on their cruise onboard Celebrity Reflection, booking an AquaClass room is a must. Not only do you have a concierge to book you treatments, your cabin is located in prime position for unlimited access to the Persian Gardens relaxation room and spa which you have unlimited access to. Ship -Fantastic, Staff -Excellent, Caribbean Islands-Spectacular. Nothing is too much trouble for the staff on this ship. The daily programme was impressive, the shows stunning and the food plentiful and enjoyable. Cant think of any more expletives to say except our first cruise was brilliant.